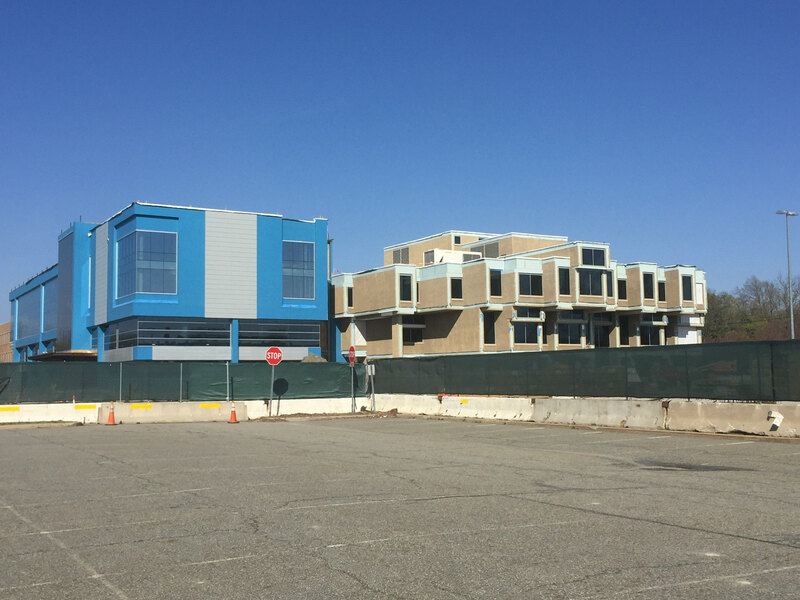 It's an all-too familiar story: a beloved local institution bites the dust as a developer swoops in to build apartments. But one modest Seattle restaurant has found a number of advocates that are fighting for it to gain lazndmark status. 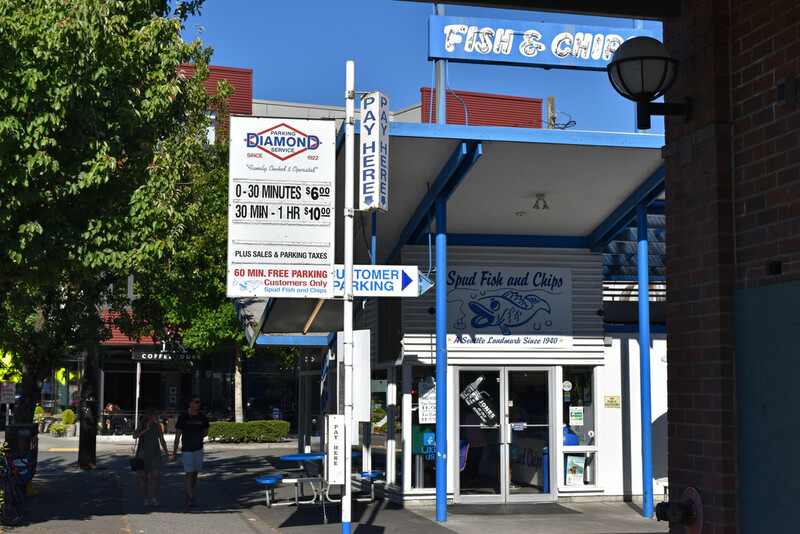 The restaurant is Spud, a fish-and-chips spot with roots that date back to the 1935, and it's the restaurant's Green Lake location that's at the center of campaign (several other Spud restaurants exist, though they are run by different ownership). After a developer announced plans to raze the six-decade-old structure in order to build a four-story apartment building, representatives from Historic Seattle and Docomomo WEWA are speaking out in support of having the building designated a city landmark, with a Seattle Landmarks Preservation Board hearing scheduled for later this month. The current plan has Spuds reopening on the first floor the new building, but preservationists argue that demolishing the current structure would mean losing one of the finest examples of the modernist style in all of the Northwest, Seattle's Daily Journal of Commerce reports. Dating back to the 1950s, the 1,637-square-foot fish shack was designed by Edward L. Cushman in the playful Googie style of midcentury modernism. The popular postwar style was designed to attract the attention of drivers to roadside fast-food restaurants, gas stations, and motels, and, like many of the type, Spud features a distinctive butterfly roof and neon sign. So far, the developer of the proposed apartment building, Seattle's Blueprint Capital, is going along with the landmark process, even requesting the landmark hearing as a proactive measure. Meanwhile, local preservationists, citing the fact that the building has been occupied with a working Spud location ever since it was built, have proposed looking at alternative designs, such as a scheme that would incorporate the new structure into the existing site. Now that the tower is on the chopping block, calls for the building’s calendaring have intensified, as the New York-based Historic Districts Council has also advocated for the landmarking. It’s important to note that 270 Park Ave. had been identified as a potential landmark by the city once before, in 2013 ahead of the rezoning, and that 12 surrounding buildings were given protection. The city had also seemed on board at the time, saying in the Greater East Midtown Rezoning Final Environmental Impact Statement that, “One of the City’s greatest modern buildings, this 53-story [skyscraper] exudes strength and elegance in its protruding stainless steel mullions and simple but bold façade patterning created by the black matte metal spandrels...The ultimate pin-stripe building.” It remains to be seen whether these letters and lobbying will fall on deaf ears, as Chase is on track to raze the tower early next year, giving it the dubious distinction of being the largest voluntarily demolished building in history. Tonight in Manhattan, Docomomo US will honor the winners of its 2017 Modernism in America Awards. 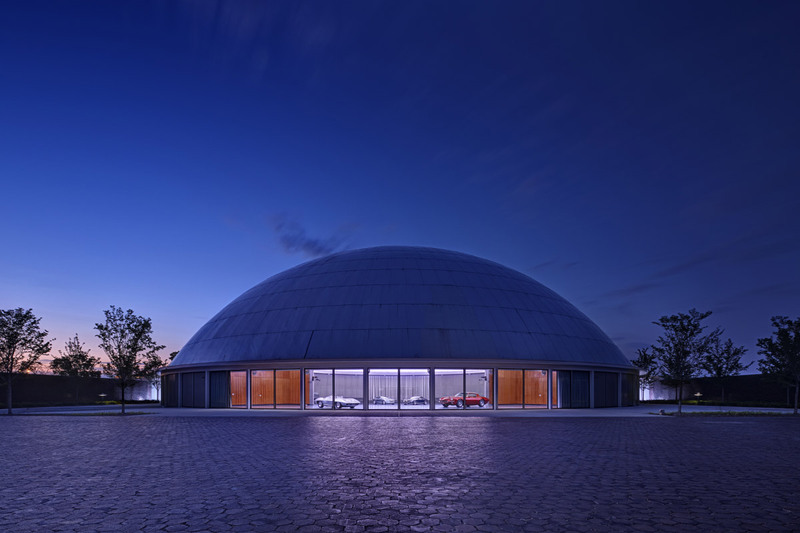 The national chapter of the nonprofit modern architecture preservation group will recognize nine projects that set high standards for the restoration, conservation, and adaptation of modernist designs. First announced in June, the awardees include famous projects like Alexander Gorlin's revamp of Eero Saarinen, Kevin Roche & John Dinkeloo's Bell Works and Knight Architecture's careful updates to Louis Kahn's Yale Center for British Art, but the jury placed emphasis on geographic diversity and regional favorites as well. 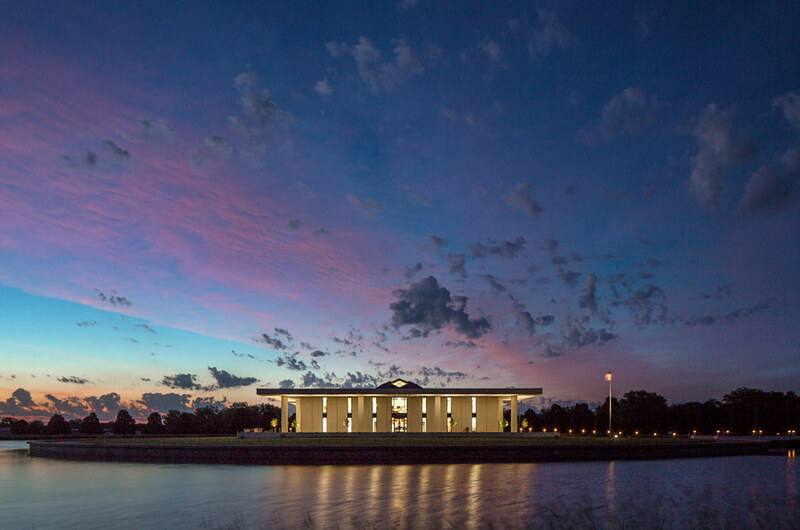 BVH Architecture's restoration of Edward Durrell Stone's Stuhr Museum of the Prairie Pioneer in Grand Island, Nebraska, is set to receive a merit award, and k YODER design's work on Vincent G. Kling's midcentury home in Gladwyne, Pennsylvania, will be honored, too. The projects demonstrate a preservation approach that responds to contemporary needs but respects the original architect's design intent. 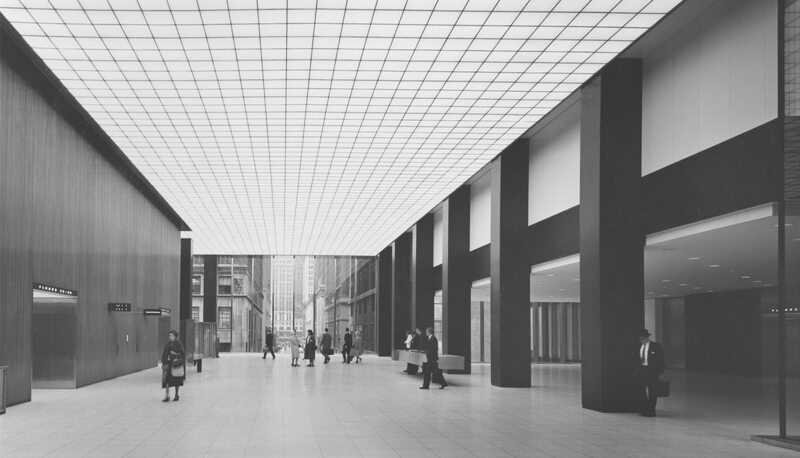 Docomomo US also honors researchers who chronicle the modern preservation movement for the public. This year, the group will honor Heroic, a book on Boston brutalism from 1960 until 1976 that spawned subsequent advocacy efforts to preserve the city's often divisive concrete architecture. The group will also honor Save the Reactor, a grassroots effort to save a landmarked Cold War–era nuclear reactor at the University of Washington, Seattle that the school wants to demolish (a legal fight over the building is making its way through the courts). While regional AIA chapters may recognize members' preservation projects, the Modernism in America Awards is the only program that celebrates modern preservation nationally. Beyond making a case for the continued importance of the modern movement, the program seeks to build public appreciation for postwar architecture, call attention to threatened buildings, and promote dialogue around the cultural or economic conditions that facilitate the conservation or jeopardize the existence of modern architecture today. Now in its fourth year, tonight's awards ceremony will be held at Design Within Reach's Third Avenue Studio (tickets required). Read more about the winners here. 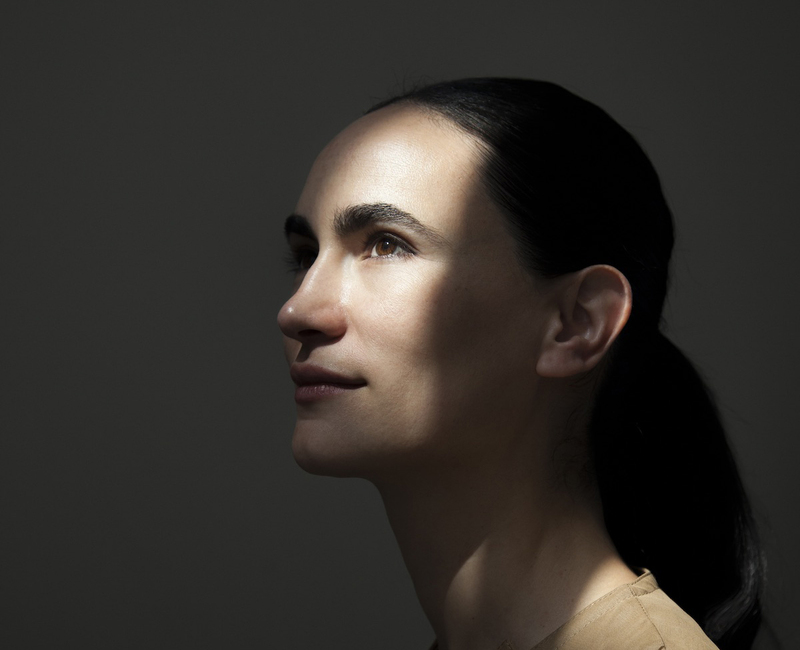 Frances Halsband, founding principal at Kliment Halsband Architects, chaired this year's seven-member jury. Joining her was Justin Davidson, New York Magazine's architecture and classical music critic; Barbara Campagna, an architect, planner, and historian; Mark Pasnik, founding principal of over,under (and Heroic co-author); Robert Nauman, member of Docomomo US's Board of Directors and a historian who currently teaches in the Department of Art and Art History at the University of Colorado in Boulder; Jack Pyburn, member of Docomomo US's Board of Directors and partner at Lord Aeck Sargent; as well as Theodore Prudon, President of Docomomo US and founding principal at Prudon & Partners. 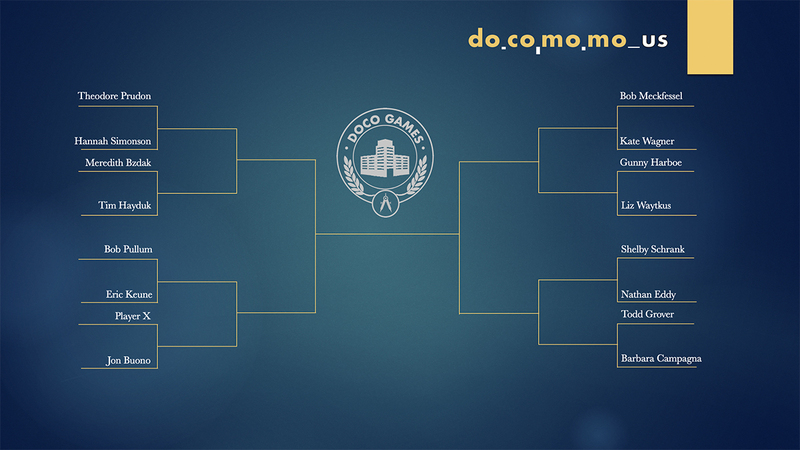 The Docomomo US Board of Directors served as the jury for the Advocacy prize. Miami has a reputation as a place that is supportive of adventurous architecture. It is home to several firms building internationally and its property developers understand the branding value of affixing design stars' names to buildings. It has, of course, been known for its winter holiday architecture going back to the 1920s and architects, for their part, seem more than willing to still build there and take a whack at a glass tower channeling South Florida’s blue sky’s, aqua water, and relaxed lifestyle. However, there was a time in the post-WWII period when Miami was less internationally focused on selling to international buyers and had a small group of local designers who tried to create another architectural aesthetic that the architectural historian Jean-François Lejeune calls ‘Tropical Brutalism.’ There is a building—known as Office in the Grove—that represents this earlier Miami aesthetic and, with its fate is uncertain, Docomomo US/Florida is asking for it to be designated as a historic architectural resource. It's is an eight-story hexagonal, concrete tower floating over a three-level, grass-landscaped pedestal and it's an example of that homegrown Miami style. It was designed in 1973 by the important Florida modernist Kenneth Treister, whose buildings are important in the urban landscape of South Florida, particularly in Miami and Miami Beach. Lejeune argues that the concrete style (arguably refined to its finest expression by Paul Rudolph on the west coast of Florida) intended to create openness in public buildings while responding architecturally to the climate, and is part of a larger argument about the style known as Brutalism. There quite a few of these public projects still in existence scattered around Florida. However, they are increasingly under attack as no longer relevant and are being reconfigured.Lejeune points, in particular, to The Miami Dade College campuses (1961) by Pancoast-Ferendino-Grafton-Burnham (with Hilario Candela as primary designer) as well as William Morgan’s Police Memorial Building (1971-75), both of which are in excellent condition. The explanation of how Brutalism was meant to be an expression of the notion of the public may be hard to understand today but was based on notions like patios, open air-circulation, monumental public entrances, and sheltered loggia "assertively conveying a nobility of public service in behalf of the law" as architect William Morgan wrote about his Federal Courthouse in Fort Lauderdale (1976-79), now threatened. Lejeune points, in particular, to The Miami Dade College campuses (1961) by Pancoast-Ferendino-Grafton-Burnham (with Hilario Candela as primary designer) as well as William Morgan’s Police Memorial Building (1971-75), both of which are in excellent condition. The explanation of how Brutalism was meant to be an expression of the notion of the public may be hard to understand today but was based on notions like patios, open air-circulation, monumental public entrances, and sheltered loggia "assertively conveying a nobility of public service in behalf of the law" as architect William Morgan wrote about his Federal Courthouse in Fort Lauderdale (1976-79), now threatened. 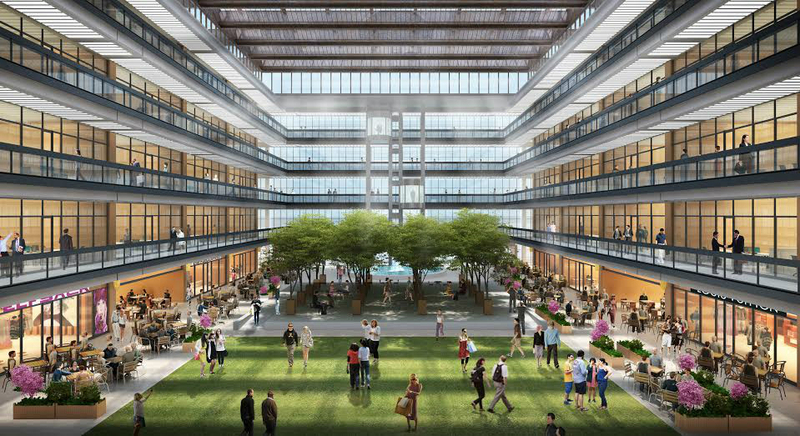 As a commercial office tower, Office in the Grove is not a public building, yet it is significant for its conveyance of ‘publicness.’ This, along with many other respects, qualifies it for designation as a landmark. Besides its substantial street presence (at 2699 S. Bayshore Drive) it is among the first buildings to be constructed of post-tensioned concrete slabs and a completely prefabricated concrete facade. It features an important integration of architecture and landscape and is a building that integrated art into its concrete surface with styled period images of the Everglades. 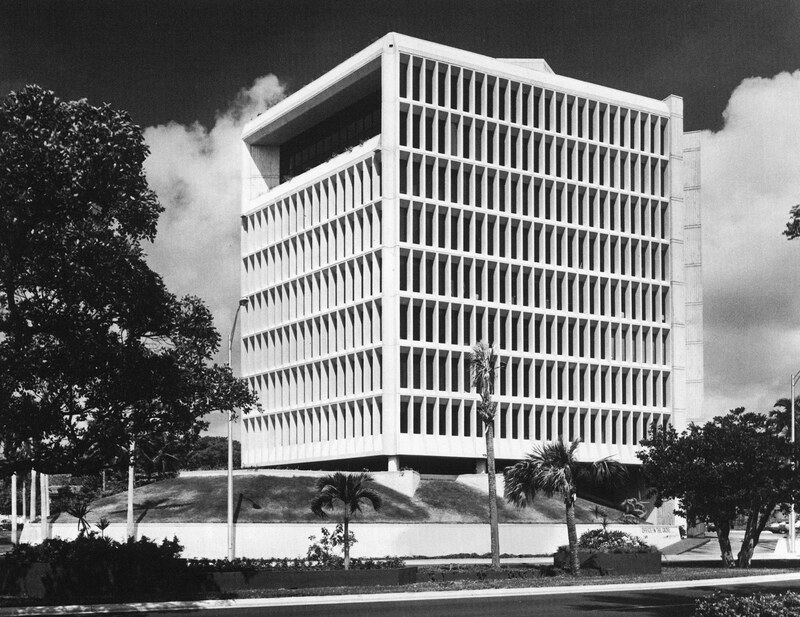 According to Docomomo US/Florida, "this was Miami's first office building to give the community an eye-level, landscaped grass berm as its facade." Office in the Grove also is one of Triester's best buildings and it would be a tragedy if it is left to the fate of developers. The hearing is September 5 and we will report on the application to preserve this important work of architecture. It will be held at the City of Miami Historic and Environmental Preservation Board's hearing at Miami City Hall, 3500 Pan American Dr., Miami, FL 33133. Preservation efforts aimed at recognizing and restoring Cuba’s storied architectural relics—long a pet project within professional and academic circles—might finally become mainstream as the country adopts market-based policies. Recent years have seen a ballooning interest in Cuba by international hoteliers. European luxury-hotel group Kempinski is set open its first hotel in Cuba this summer. The hotel will feature 246 rooms in the renovated Manzana de Gómez building, a UNESCO World Heritage site that was designed as Cuba’s first shopping mall in 1910. Starwood Hotels & Resorts Worldwide is also entering Cuba by taking over operations of Havana’s neoclassical Hotel Inglaterra, the Hotel Quinta Avenida, and the colonial-era Hotel Santa Isabel. 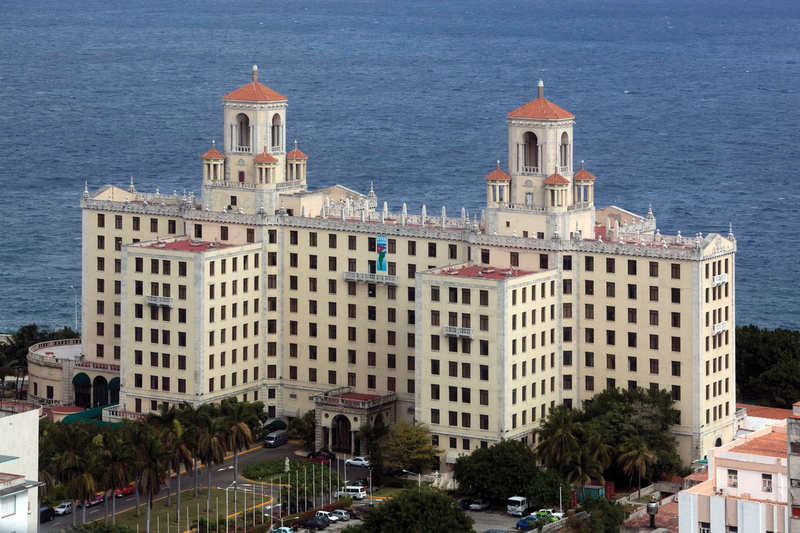 The move makes Starwood the first United States hotelier to enter the Cuban market since 1959. Hotel Quinta Avenida was renovated in 2016 and opened last summer. The Hotel Inglaterra, originally built in 1844, is expected to open in late 2017 after its renovation. Real questions exist, however, not only in terms of the quality of these renovations, but also with regard to the status of other cultural, archeological, and architectural artifacts in the country. Cuba is home to a vast array of architectural history, including relics and sites important to the indigenous cultures that originally inhabited the island. However, colonial-era fortifications and more recent building stock, including successive waves of 18th-, 19th- and 20th-century development, make up the vast majority of structures across the country. What will happen to those less prominent and more sensitive relics? Many of the city’s inner neighborhoods are filled with eclectic Beaux Arts–style structures, while the outer city and its environs are a hotbed of proto- and early-modernism, with works like the Hotel Nacional by McKim, Mead & White from 1930 and the Habana Libre Hotel by Welton Becket with Lin Arroyo and Gabriela Menendez from 1958 standing out both in terms of architectural style and for their respective roles in local and international history. Furthermore, the Revolution’s communist utopianism was codified through the prodigious production of radically progressive works of architecture by Cuban modernist architects. Those works include the expressionist National Schools of Art by Ricardo Porro, Vittorio Garatti, and Roberto Gottardi from 1961; the Brutalist Ciudad Universitaria Jose Antonio Echeverria (CUJAE) building by Humberto Alonso from 1961; and the vast neighborhoods of Habana del Este that are made up of locally derived designs modeled after Soviet modular apartments. The effects of the recent formal economic and political changes in official policy are not necessarily new phenomena, however: Havana has strong track record of using historic preservation as an economic driver. The office of the City Historian, led by Eusebio Leal Spengler, has pioneered local attempts to embed the preservation and restoration of Old Havana’s neighborhoods into economic development plans. Old Havana is a UNESCO World Heritage Site in its own right, and while many projects in the colonial core have benefitted from Leal Spengler’s efforts—namely the restoration of Plaza Vieja and a slew of other properties the office has converted for hotel and tourismuses—many of the city’s early modernist and post-revolutionary architectural marvels sit in various states of decay and disrepair. The restoration of the National Art Schools was, until recently, slated for completion and renovation. Those efforts have petered out, subsumed by a new economic downturn following geopolitical turmoil in Venezuela, one of Cuba’s chief oil providers. Ever wanted to live in a home designed by a world-famous modern architect? Well, here's a chance: The owner of Philip Johnson's first built commission is looking for a buyer, and fast. 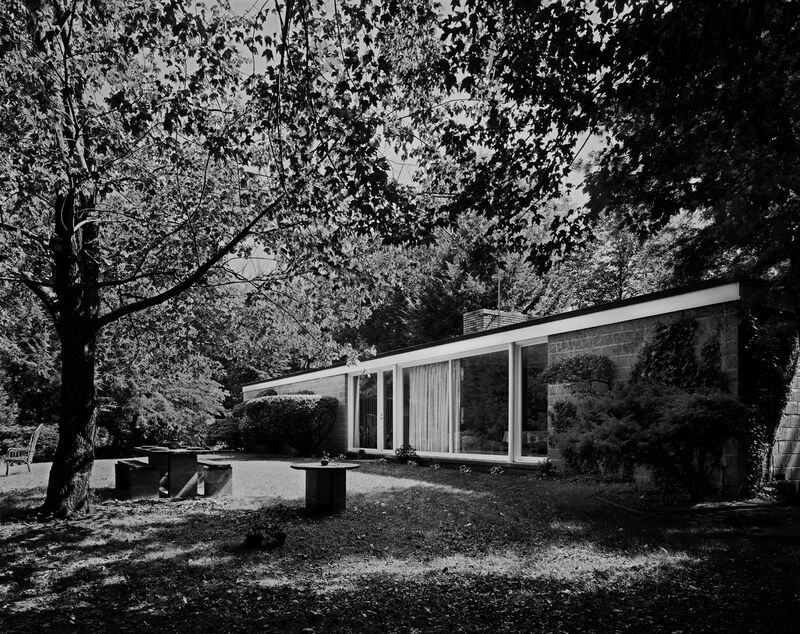 Johnson's Booth House, built in 1946, predates the Glass House by three years and was the architect's first built work (not counting his Harvard GSD thesis project). Like the Glass House, which Johnson designed for himself in New Canaan, Connecticut, the Booth House in rural Bedford, New York sits on a grassy podium, sports floor-to-ceiling glazing, and is organized internally around a commodious brick fireplace. The owners—architect Sirkka Damora and her husband, architectural photographer Robert Damora (1912–2009)—moved in as renters in 1955 and never left. 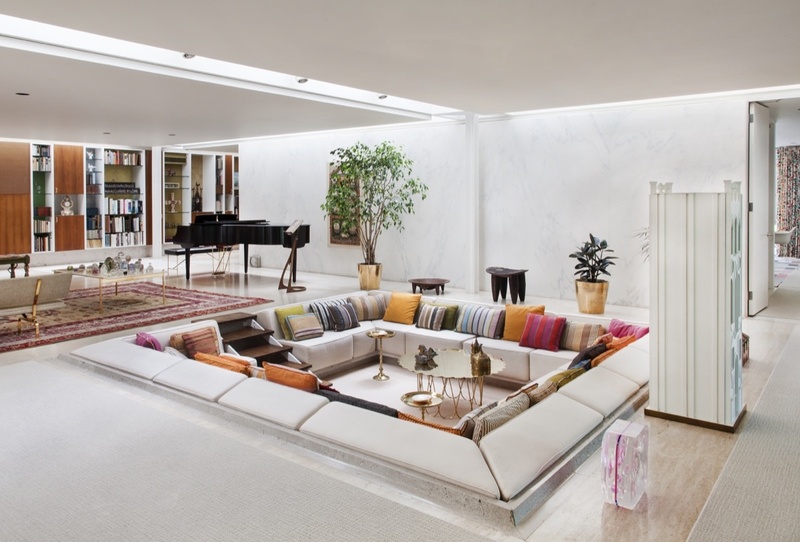 After buying the house in the 1960s, they added almost 900 square feet of below-grade space to the 1,450-square-foot home, expanding the layout for a growing family without substantially altering Johnson's design. The couple's son, Matt Damora, has distinctive memories of growing up in what would become a seminal work of modern architecture. "It's all I knew, but every friend that came by thought it was entirely weird," he said. In a town defined by Colonial Revival homes with decorative entrances and functionless shutters, "they weren't used to the idea of floor-to-ceiling glass, or open plan spaces—the lack of ornamentation, they didn't know what to do with it." Damora's architect parents clearly felt differently, even building an 800-square-foot studio on the two-acre property that dialogued with Johnson's design. Now 93, Sirkka is looking to sell the house, and soon. She wants "appreciative stewards" for her home of 62 years, according to a post Matt submitted to Docomomo, the modern architecture preservation association. There are a few complications, though: The title of the house is in litigation, which—depending on the outcome of the case—could jeopardize its very existence, Matt explained. Readers may recall that this is not the first time the house has been on the market: Back in 2010, the family tried to sell the home for $2 million, but the post-Recession market in Westchester County wasn't strong enough to close a deal. This time, the home is back on the market for $1 million. With the house's fate uncertain, Matt fears that a future developer could demolish the (small by today's standards) home and build a McMansion or two on the property, which is adjacent to a developable lot. Considering the urgency of the family's project, Matt has made his contact information available to the public in hopes of expediting a sale: He can be reached at r[dot]damora[at]verizon[dot]net or 718-230-8858.